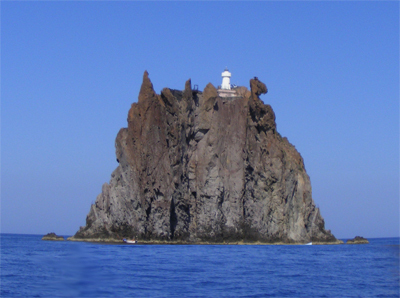 A small volcanic island situated about a mile from Stromboli, rappresents the most northern point of the Sicilian region. Baron and an uninhabited Strombolicchio is up to 50 m high and extends over a surface of 300m2. It is part of the same geological base and is a rare example o the volcanic neck formed from the solidification of magma from the inside of the crater , visable due to the erosion of the friable cone. An Aeolian leggend tells the story of the small island and the top of Stromboli that was thrown into the sea during a violent eruption. It origins begin over 200, 000 years ago and it is the first volcanic complex of Stromboli. The eruptive mouth, when unable to find other ways to escape through the earlthy crust, moved slightly creating about 100.000 years ago volcano of Stromboli. In 1991 strombolicchio was declared a complete natural reserve for its extreme natural interest. preventing tourists to visit the island. It is home to sporadic vegetation but of very high interest, such as the “granata rupicola” a flower that risks extinction, it can also be found on the island of Caprì. Amoung the vegetation dianthus rupicola, Matthiola incana, Hyoseris taurina, Euphorbia dendroides and Ephedra can also be found. It’s wildlife aspect is also very interesting due to the presence of the aolian lizard ( podarcis raffonei) found only on Salina, Filicudi, and some areas of Vulcano. The common gecko is also relatively diffused. the submersed part of Strombolicchio is home to encrusting algae, sponges, marine annelids, byrozoans and gorgionians and is a paradise for divers.